I have many different reasons for choosing books to read. Sometimes, I read to inform myself, to learn new things, to develop different aspects of myself. Other times, I read to counteract the forces in my own life, to bring into my day-to-day experience the things that I feel are missing. In both cases, I’m looking for an escape. In the first case, I want to be someone other than who I am; perhaps that person is someone who understands number theory, or understands ants, or is a more ethical, scientific, or otherwise better version of myself. In the second case, I want to see the world differently, to experience the world as someone else experiences it, because I believe that there is something missing in the way that I see and experience the world around me. 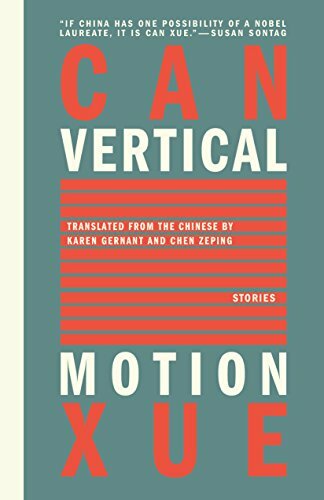 It was for the second reason that I began reading Can Xue’s Vertical Motion. The book is a collection of very peculiar short stories, which are all very magical and surreal and strange. In one story, a woman finds a large, evil owl in her backyard. In another, a couple plants roses underground that grow upside down. In the title story, strange underground creatures that seem to be a mix between earthworms, moles, and birds have legends about what lies above the layer of soil they inhabit. Each tale feels like a dream, in which strange things are made ordinary, in which a house floating above the ground is something that you see and know isn’t supposed to exist, but that exists nonetheless and is something to be reckoned with. Reading Vertical Motion was transformative. It was the exact book that I needed to read in the moment, the precise way that I needed to see the world during the moments I spent sitting on my couch, reading slowly through her strange stories. As soon as I began to read the very first story in the collection, I knew that this, this very book, was what I had been missing. And I’d been missing something very important. These days, I edit and write for a living. Every day is filled with various ways of writing, editing, and reading. It’s the life I’ve always dreamed of living, and I can imagine no better way to spend my time, no better way to spend my life, than to be completely, continuously immersed in writing and reading. I’m an editor at The New York Times, where I commission and edit opinion pieces. I also write things of my own: I’ve just finished a memoir, am about a quarter of the way through a very fun novel, and am finishing up research for a book about physics. Being so immersed in writing — especially the writing of others — is a curse just as much as it is a blessing. Over the years, I’ve found that I become what I read. If I sit around reading nothing but computer science textbooks, I start thinking and seeing in the ways that the textbook authors speak. If I sit around reading other people’s tweets, I start thinking and seeing in short 280-character attention-grabbing quips. Since my day job is concerned with op-eds at The New York Times — a newspaper with a very consistent and strong style — the more I edit and read, the more I start to think and see the world in a very specific way. When I say “see the world,” I do not at all mean anything political or ideological. What I’m talking about is far more primitive, more abstract, than any of that. It’s about the words that I use to talk about the world, the way I structure my sentences, the way I structure my thoughts, the way I interpret the world around me, and, even more importantly, the way I actually see the world around me. It is about looking at a beautiful tree in a forest and the question of whether I see a long list of practical, descriptive “facts” about the tree or I see a poem; the question of whether, when I look at the tree, I hear the sound of the wind blowing through the leaves of the tree or I hear one of my favorite pieces by Franz Liszt. It is sort of like wearing different kinds of glasses. It is about the multiplicity of ways that I can experience the world around me. Whenever I am limited to only one way, I feel that I am short-changing myself, that I am missing out on the wonderful vastness of the world and all of its glory. Reading poetry almost always does the trick and opens the world back up to me, as does listening to or playing classical music, but none of these things have helped me very much lately. Over the past several years, I have felt that I am only able to see the descriptive facts about the trees, only able to hear the sounds the wind makes. I suspect it is because I have been so immersed in nonfiction (having just finished my memoir) and have been editing very straightforward pieces by other people, first with the technical pieces at Increment and now with the opinion pieces at the Times. I was starting to fear that I had stopped being able to see what I like to call “the things around the edges” — these different, magical ways of seeing and describing and feeling the world around you. But Can Xue brought me back. In her stories, she pulled all of the things around the edges into the light, so that they no longer exist along the fringe of life but right in the open. As I read each tale, I couldn’t help but wonder what things lived in the edges around my life, and I kept wanting to throw the book down and run to my computer and write, believing that I could find the things around the edges and bring them to life. And that’s how I knew that I’d been cured, that’s how I knew I was going to be ok. I felt alive again.